Raleigh Brewing Company (RBC) beers have been no stranger to the fridge in my home for quite some time. My wife is a fan of “Hell yes Mam” and long before visiting this brewery I’ve enjoyed “House of Clay”. So why has it taken me so long to visit this Capital City Brewery? I don’t know, I have no reasonable explanation or excuse. After visiting it once with my friends (also known as the Brew Crew, I then revisited RBC with my wife two weeks later. I feel certain I’ll be back again soon. Since it is located in an old industrial facility, just outside of the NC State University campus and right across the street from Meredith College, I guess I was expecting (or fearing) a frat hangout. Instead, I found the patrons to be diverse in age. 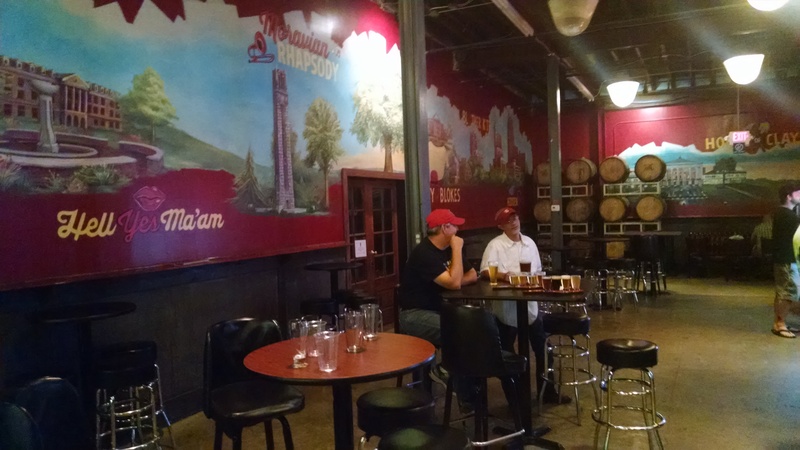 The taproom is a roomy pleasant space with fantastic murals that pay tribute to North Carolina’s capital city. The entire taproom is sporting a Red and Black theme, the colors of both NC State and the NHL’s hometown team, the Carolina Hurricanes. With flat screen TV’s above the bar and dart boards available for patrons to enjoy, this brewery has a fun sports bar feel. 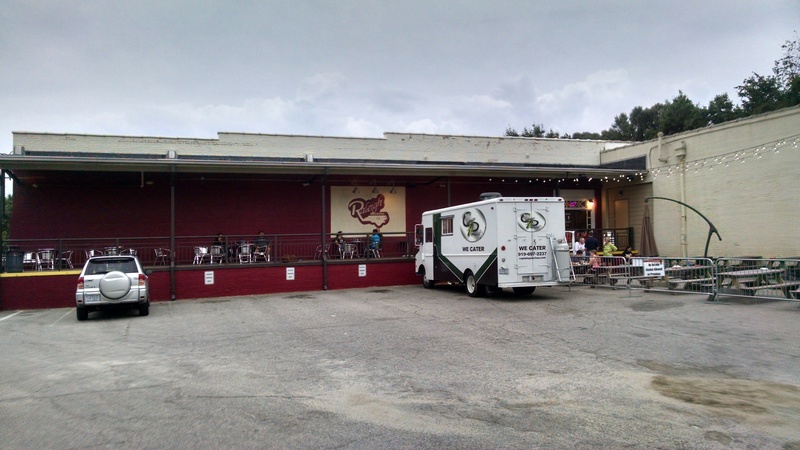 The old covered loading docks have been converted to outdoor seating that is popular on mild Carolina nights and an area of the parking lot acts as a beer garden complete with picnic tables. Many of Raleigh’s finest food trucks frequent this establishment. 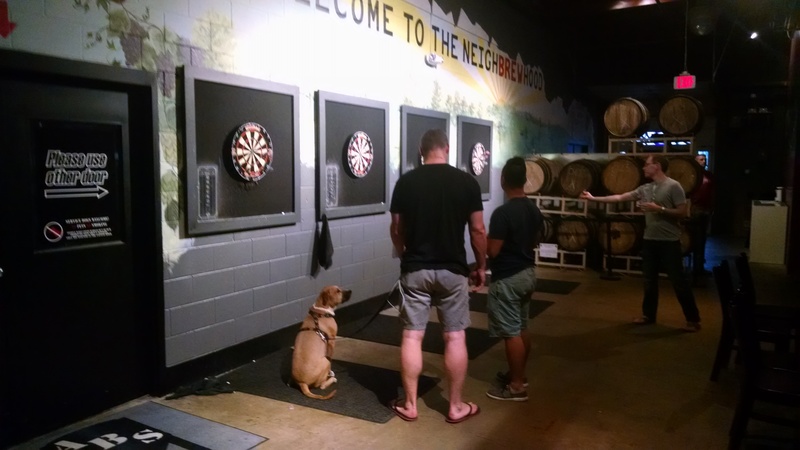 As with many breweries in our state, dogs on a leash are welcome – so bring your best friend for a beer. Over all this is a comfortable place to grab a beer. Hell Yes Ma’am– This Belgian Golden Ale is the mild beer that packs a punch. One of my wife’s all-time favorite craft beers (North Carolina or otherwise), it is one of this brewery’s best sellers. At a 9.2 Alcohol by Volume (ABV) it can sneak up on you. This beer is widely distributed throughout the Triangle area. If you haven’t tried it yet give it a go and see why so many love this beer so much. 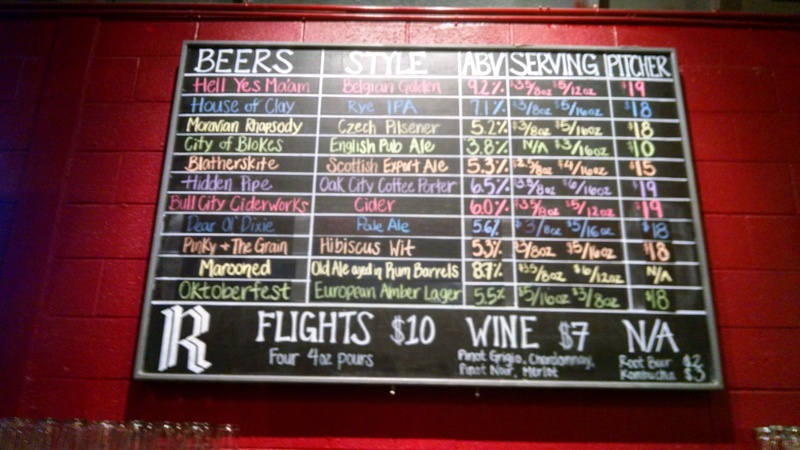 House of Clay– A rye IPA, you don’t find at most craft breweries. This beer was the reason I wanted to go to Raleigh Brewing Company so bad. I love the rye spice finish with the hop forward taste of this beer. As much as I enjoy this beer, I was surprised to find once I started sampling the beers at the taproom that I found a couple of beers I liked even more, a tribute to the depth of quality beers available. Moravian Rhapsody– This Czech Pilsner is a mild good entry level beer that helps to bridge the gap between domestic American beers (Budweiser) and the world of craft brew. Like most Pilsners this is a crisp mild beer. Craft beer enthusiasts will often avoid this type of brew, complaining it lacks flavor or bitterness, but there is a place for beers like this to help bring more people into the craft beer camp. City of Blokes– I have a soft spot for sessional English Style Ales. This ale has low carbonation and very low Alcohol by Volume (ABV). A nice mild subtle flavor, you can safely have another. Dear Ol’ Dixie– A wonderful Pale Ale. This beer is very well balanced and it has a pleasant flavor. This is one of the best Pale Ales made in the Carolinas. If you are a fan of (as I am) Draft lines Brewing’s “Graff Pale Ale” or Oskar Blues “Dales Pale Ale,” you will love Dear Ol’ Dixie. Unfortunately this is a seasonal beer and not available year around. Octoberfest– Beautiful amber color with all the right fall notes, this is an excellent example of wonderful seasonal ale. I was so grateful to visit this brewery while this beer was on tap. 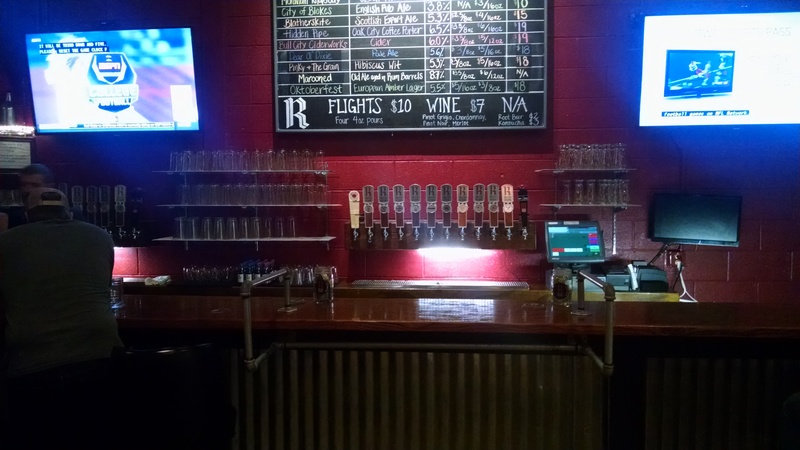 I can easily see why any Triangle resident might choose Raleigh Brewing Company as their default home brewery. Its diverse beer selection means everyone in your Brew Crew can easily find something they enjoy. It won’t be long before I am retuning and I will likely bring a crowd. 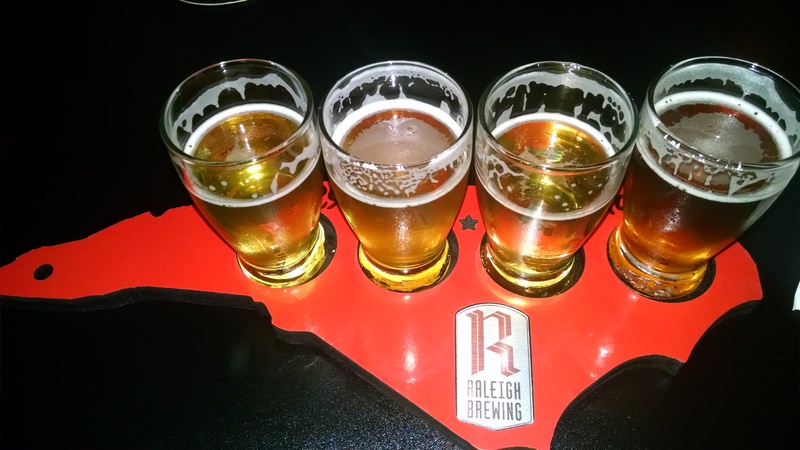 I would encourage you to drop by Raleigh Brewing next time you’re in the Capital, have a flight or pint or two and let us know about your experience.